Restaurant Planning, Design, and Construction: A Survival Manual for Owners, Operators, and Developers. New York, NY John Wiley & Sons, 1997. Hardcover First Editio ; First Printing indicated. INSCRIBED AND SIGNED BY THE AUTHOR. Near Fine: Shows a small scuff at the upper front panel, causing a very short tear in the laminate; else flawless; The binding is square and secure; the text is clean. Virtually 'As New'. NOT a Remainder, Book-Club, or Ex-Library. 4to. 247pp. Hardcover: Pictorial Laminate Boards. INSCRIBED AND SIGNED BY THE AUTHOR. 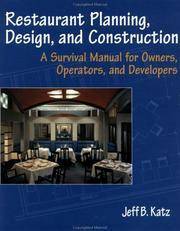 Title: Restaurant Planning, Design, and Construction: A Survival Manual for Owners, Operators, and Developers. Edition: First Editio ; First Printing indicated.